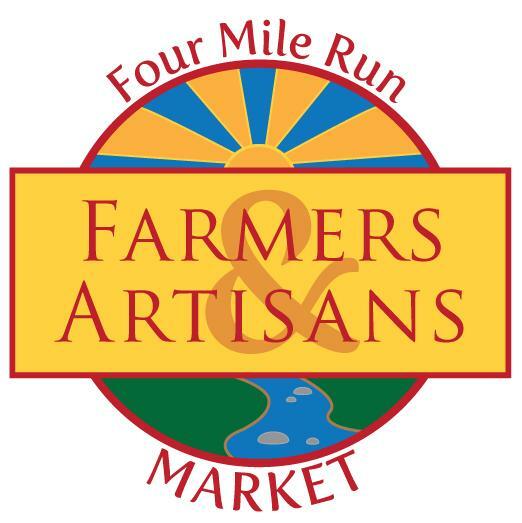 The Four Mile Run Farmers & Artisans Market has a lot of exciting news for the upcoming 2013 season, set to begin on the second Sunday in April (April 14th)!! This past January - for the second year in a row - the 4MRMarket team presented the City of Alexandria with a check for $1,000 to further the revitalization of Four Mile Run Park. In addition to making financial donations, the 4MRMarket team has provided site improvements through "sweat equity" and by soliciting donations, both big and small. Last year, an anonymous donation of $10,000 helped support a NEA grant to build a performance stage. Other private donations and grants are being sought to provide park furniture, a green roof, plant rain gardens and other park improvements. The efforts have received coverage on NPR. 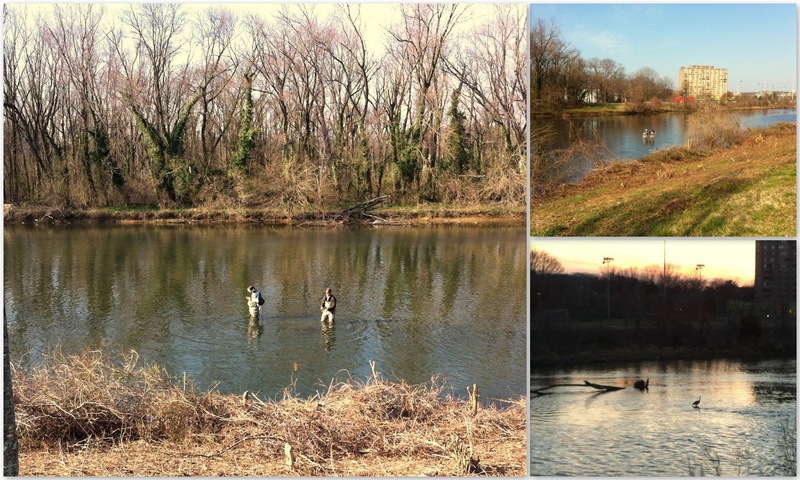 The 4MRMarket team has also been leading and participating in Four Mile Run stream clean-ups over the off-season and - on Opening Day this year - we will be assisting Casey Trees and the Arlington Tree Stewards with a massive tree planting adjacent to the Four Mile Park Expansion where 4MRMarket is held. The Four Mile Run Expansion Continues..
As the first market in Northern Virginia to accept SNAP/EBT sales, market management has continued to secure double dollar incentives, in conjunction with INOVA Health Foundation and the Alexandria Health Department, to bring healthy food to people of all income levels. Our third season was a year of additional progress for the market. The market grew more established and we added credit card sales.SNAP/EBT and credit card sales accounted for a total of over $5,500 in sales during the season. This year, we have assisted other markets in the area to launch their own SNAP/EBT programs, giving those in need of healthy food options more choices. As a 100% neighborhood volunteer run market, we are proud that the market serves as an incubator for small start-up businesses, a space for non-profits to promote their causes, and a community gathering place for live music, fellowship, and quality food and craft options. As a convenient bonus, 4MRMarket now processes Credit Card payments for all vendors, as well. Stay tuned for upcoming dates for a 4MRMarket meeitng. We will also be spending some time at the site doing some prep work and volunteers are welcome to meet us then too. The Work Continues...and it's Working. 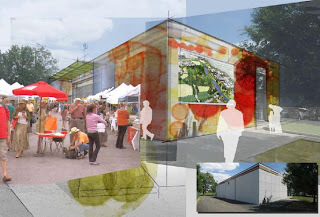 We've been hard at work at 4MRMarket, but not as hard as a group of award-winning, volunteer architects called Architects Anonymous that has helped the community to form and embrace these changes. Their vision along with a lot of hard work from a whole lot of people is becoming a reality and the impact on the park has be phenomenal. Please read this article in The Arlandrian to find out more about these changes to the market space and Four Mile Run Park. BUY. Proceeds of our 4MRMarket T-shirts go to support the expansion and revitalization of 4MR Park. They cost $12 and come in 4 colors. You can pre-pay via Pay-Pal (4MRM@arlandria.org). DONATE. Help 4MRMarket help 4MRPark. 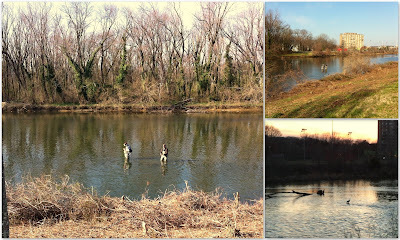 Tax-deductible donations can be made to support us in our efforts to revitalize Four Mile Run Park. 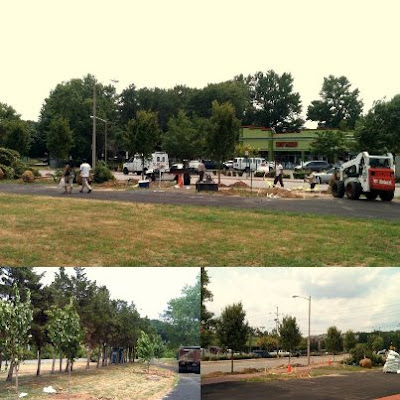 Donate to the Alexandria's Living Landscape Fund to fund trees, benches and other amenities at 4MRExpand. HELP. If you'd like to volunteer with the 4MRMarket, go to: volunteer.4MRMarket.org. 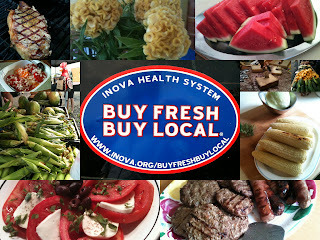 We need help processing SNAP/EBT sales, keeping our books, and with set-up on market days. Email us at 4MRMarket@arlandria.org for more info. READ. Keep up to date on all the goings on by following 4MRMarket on Facebook or Twitter or via our website. After an earlier report from the UrbanTurf blog that reported a mid-2012 project start, MRP Realty and the JBG Companies announced the start of construction on The Alric, the first phase of The Exchange at Potomac Yard. The Exchange at Potomac Yard is a 14-acre Town Center parcel within the overall 300-acre Potomac Yard community in Alexandria, Va. The Exchange will be developed by both JBG and MRP and will comprise nearly 2 million square feet of retail, office, hotel and residential space. Located in the heart of The Exchange at Potomac Yard, The Alric will be a 323-unit, Class A multi-family apartment development. It is located at 731 Seaton Ave., adjacent to the future Potomac Yard Metro Station with Yellow and Blue Line service, and within minutes of historic Old Town, the Pentagon, Crystal City and Ronald Reagan Washington National Airport. The project will feature a mix of studio, one- and two-bedroom residences in dual five-story buildings that are separated by a public mews. The Alric is expected to be completed by the end of 2014. The project, designed by SK&I Architectural Design Group (designers of the Madison by Braddock Road Metro and Lofts 590 in Crystal City), will include a roof terrace with an indoor lounge that offers spectacular views of the Washington skyline and the Potomac River. Additionally, the community will offer internal courtyards, private patios on the ground level, extraordinary common area amenities for its residents, a pool, and outdoor seating areas. In addition to Pulte’s high-end townhome and condominium development to the south of The Alric, a neighboring 24-acre public park with playgrounds, playing fields, tennis, basketball and volleyball courts and a bike trail that connects with the Mount Vernon trail will be completed this summer. Prior to delivery of the new Metro station, Potomac Yard will also feature Bus Rapid Transit (BRT) service on Route 1 connecting Crystal City to Old Town Alexandria. An osprey, a great egret and plenty of humans were fishing along Four Mile Run this past Saturday. The City of Alexandria has been quietly rolling out a new issue reporting system on their website: alexandriava.gov over the last few years. 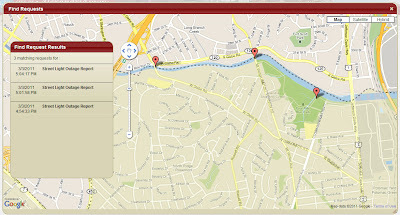 Back in March of 2011, we reported about a nifty new GIS-based system that not only allows you to help locate the problem on a map, it also offers you the ability to upload supporting documents or pictures and retains the request for you under your account so you can check back later to see the results. The system is live now, but one major difference: you can no longer report streetlight outages online. Back when we tested the system, two years ago, both the City and Dominion Power (the provider of the lights) offered online outage reporting systems. The pic above is a screen captured from our test to report broken streetlights. A vandalized street light waiting repair. Public Streetlights - If the light is on a public street, it's most likely a streetlight. Streetlight outages must be reported by calling us at 1-866-DOM-HELP (1-866-366-4357). We've tried this and it does work, but it's slow. It took us, on average, 12 minutes to make each report over the phone. And yes, when you have a few reports (say 10) to make, as we have, it can take HOURS. The problem with streetlights is not unique to Alexandria. Greater, Greater Washington had a recent post about similar challenges in Arlington County: "Arlington confronts challenges of streetlight ." And there's still the human element involved in any system (other reports we made got redirected when City staff found and fixed other problems instead of the one we reported). But those issues aside, Alexandria's new system, dubbed Call.Click.Connect is a major step in the right direction. City of Alexandria Launches Call.Click.Connect. On January 28, the City of Alexandria launched Call.Click.Connect., a new customer service initiative that combines people, processes and technology to deliver information, services and solutions to the public through a centralized, streamlined process. At the heart of the initiative is an online system for entering, tracking, and resolving service requests, designed to help the City respond more efficiently to requests from residents and the public. Users can call 703.746.HELP (4357), or click the Web portal on alexandriava.gov to easily access information and connect with their City government. Options that allow customers to create and track the status of their own requests, from start to finish, either online or by telephone. A Contact Center staffed with experienced professionals to respond to customer inquiries. 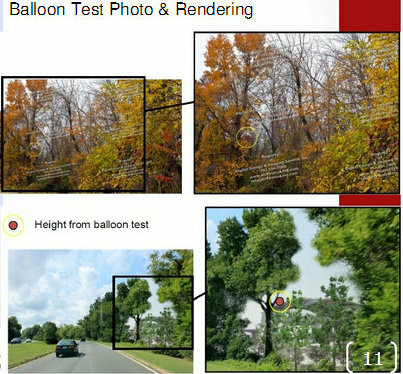 The ability for the City to use information documented through Call.Click.Connect. to track service request trends, determine emerging policy concerns, improve service delivery and make better policy decisions. For more information, visit the Call.Click.Connect. page on alexandriava.gov, or call the City’s Contact Center at 703.746.HELP. Mount Vernon Avenue traffic was halted in both directions this morning between 8:30 and 9:00 to respond to a crash involving a pedestrian crossing in a marked crosswalk. 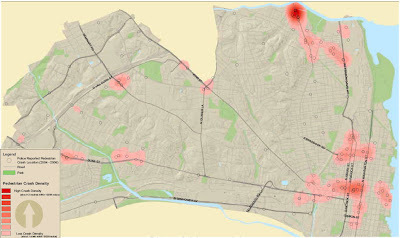 Alexandria 2008 Pedestrian and Bike Mobility Plan highlighted the intersection as the only high crash density site in the City. The accident did occur on the Alexandria side, at the intersection of Mount Vernon Avenue and Four Mile Road. At about 8:30 a 68-year-old man was crossing Mount Vernon in the crosswalk at Four Mile when he was struck by a car turning left onto northbound Mount Vernon. The driver was charged with failure to yield right of way. 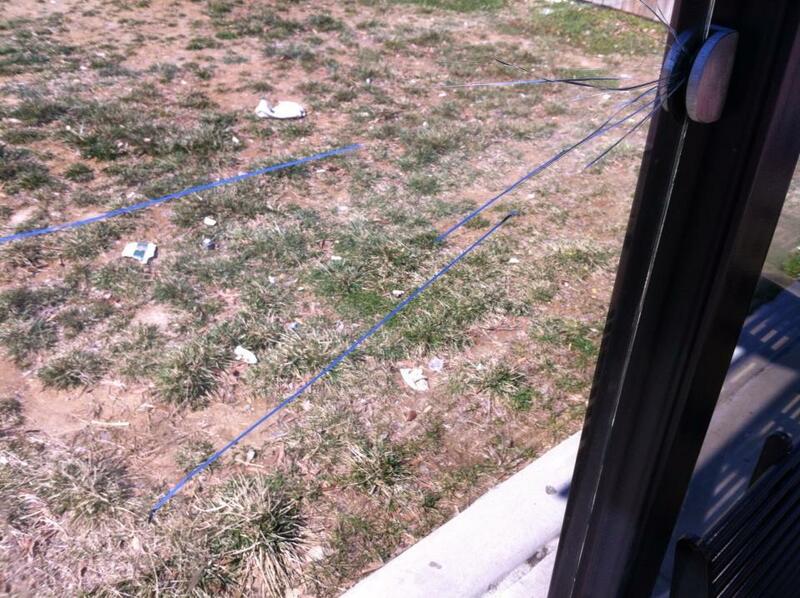 The report indicates minor injuries to the pedestrian, and he was taken to Alexandria Hospital for examination. The driver blamed sun glare. In 2009, The Arlandrian reported on earlier attempts to rectify the intersections, which have been the topic of discussion for over a decade but promised improvements have yet to occur. The Mt Vernon & West Glebe intersection was slated for improvements since the 1991 Transportation Master Plan Update. The South Glebe and Mt Vernon intersection improvements were called for by the 2003 Arlandria Plan. 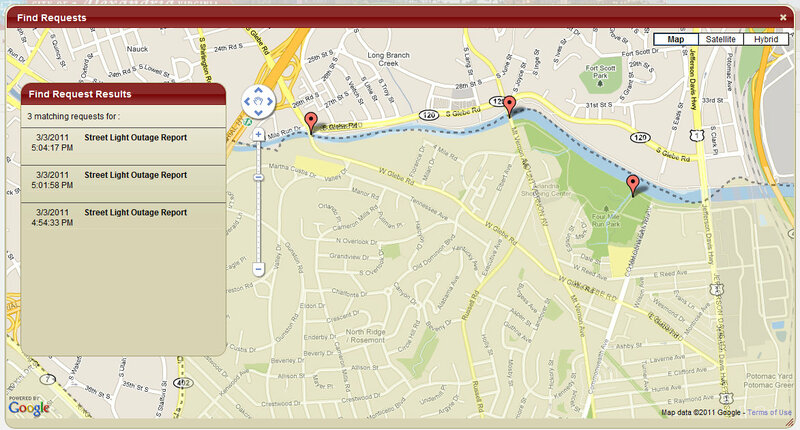 And the West Glebe & Valley Road intersection was cited for improvements by the 2005 Four Mile Run Restoration Plan. The South Glebe and Valley Road projects were absent however from the most recently approved Capital Improvement Budget and Transportation Long Range Plan (LRP). The West Glebe intersection is mentioned in the LRP but remains unfunded. 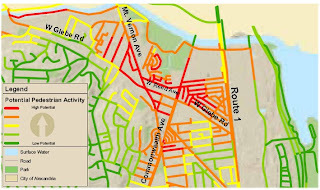 Background on the issues can be found in Alexandria's 2008 Pedestrian and Bike Mobility Plan.The first graphic, below, shows the intersections in question had medium crash density compared to similar sites, City-wide. The only high crash density in the city was just North between Russell Rd and Four Mile Run on Mt. Vernon Avenue. (Nothing has been done to resolve that issue). 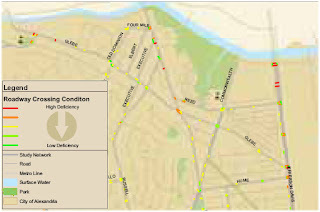 This second chart identifies these intersection as providing fairly poor quality crossing conditions. This supports the need to make improvements at the sites. Finally, this third chart demonstrates the high volume of potential pedestrian activity. The relatively poor crossing conditions coupled with a high potential pedestrian activity further support the need to increase the quality of these intersections for pedestrians to avoid future pedestrian-related accidents at this site. WMATA did not elaborate on the causes of the repeated congestion. 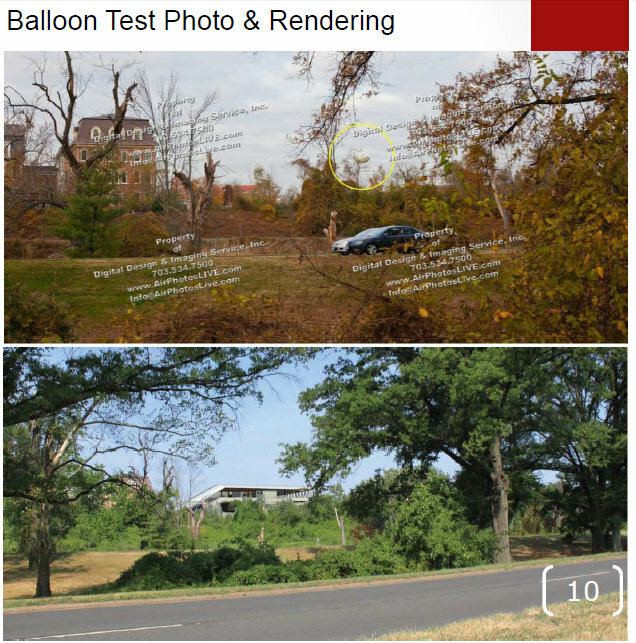 Our inquiries regarding funding for the stalled 2009 effort have not been addressed. We STILL didn't even get a chance to report about the recent upgrades to the bus shelter at Mt Vernon and West Reed Avenues. No, not yet. 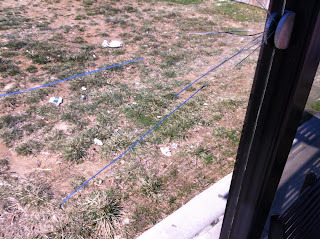 And it was vandalized today...for the THIRD time since it was installed. "Science fiction fans will recognize this plot line. A woman travels into the past, telling her ancestors about her reality in the future, only to be called a lunatic because of the incredible nature of what she is saying. Anyone who lives and works in 2013 Arlington, Virginia might be met with the same reaction if she were to go back to 1979 and tell someone about the county’s population, employment, and transportation trends. Arlington’s population and employment have jumped nearly 40 percent over the past three decades. Meanwhile, traffic on major arterials like Wilson and Arlington Boulevards has increased at a much lower rate or even declined."